These dues are extracted through legislative grants of powers and privileges to the union movement that force even unwilling employees to pay money to the union. But in spite of the expansive revenue and legal privileges unions possess, requirements that they disclose their financial dealings are minimal. Financial information in the IRS and Labor Department forms provide little insight into the various functional areas where union money is received and where it is spent, and leave plenty of nooks and crannies for hiding questionable activities. This lax oversight invites abuses that cheat union members. Waste and corruption plague many union locals, sapping resources from the union movement and leaving workers to foot the bills. In order to create some worker protection, the U.S. Supreme Court has placed limits on the collection and use of fees charged to nonmembers. All workers in a unionized workplace have the right to resign from the union and pay only for negotiation, contract administration, and the handling of grievances. Nonetheless, union officials are determined to deny dissenting workers information and keep these fees as high as possible. By exploiting loopholes in campaign finance laws, unions are able to pretend they spend relatively little on politics, even while building tremendous political influence. The political stances unions take are contrary to those of many dues-paying workers. Many activities that are political in practical terms aren't necessarily listed as political. Workers who question the union's use of dues commonly encounter stiff resistance from union officials. Passage of a Union Accountability Act would go a long way toward solving these problems. Since the 1930s corporations have been obligated to file detailed reports. The same should be true for labor unions. Reform of the federal reporting system, which governs private-sector unions, is very much needed but unlikely in the current political climate. A better bet is to begin with public labor union affiliates, which, in Michigan, are not required at all to report under any federal or state labor law. Michigan can correct this problem by amending the Public Employment Relations Act (PERA). PERA should require annual union reporting according to functional spending categories and should furthermore require an annual audit by an independent accounting firm. Violations should result in the loss of mandatory union dues and, in extreme cases, trigger a de-certification election, in which the union could lose representation rights. Amending PERA to include a strong reporting requirement would give union members a new understanding of how their locals operate; information that would assist them in challenging union officers who are not doing their jobs well. All workers would benefit from an atmosphere of openness and accountability in which misuse of funds is discouraged and union politics is brought out into the open. The result would be stronger unions with a renewed focus on the workplace concerns of members. 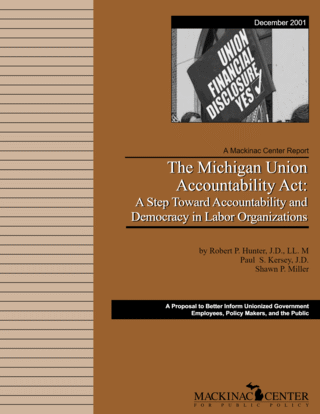 By passing a Union Accountability Act, Michigan could take the lead in protecting the interests of all workers, a goal that all union supporters should approve. Estimated, see p. 6 of this report.